Jon Dorenbos performs magic trick for Eagles on holiday special of "America's Got Talent." In what has been a year of rough-sledding for the Eagles at the bottom of the NFC East, one of the team's brightest spots has actually been the long-snapper's work off the field. Everyone is by now familiar with the magical abilities of Eagles lifer Jon Dorenbos, who recently received a three-year contract extension in Philadelphia before suffering a season-ending wrist injury in last Sunday's loss to Washington. Even though Dorenbos didn't win it all on "America's Got Talent," he clearly demonstrated his flare for mysterious presentation and creative tricks as he picked up the bronze. 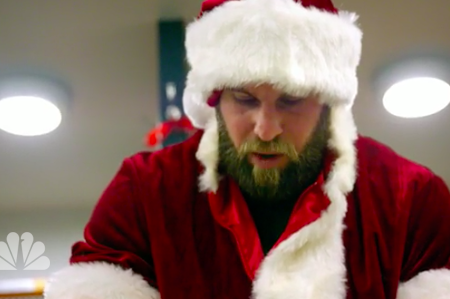 As we enter the holiday season, Dorenbos has a special "Philly-style" trick to share from a taped sit-down with Eagles staff and players, including a riveted Brandon Graham. Fittingly, the jack of all trades performed a magic trick involving jacks. The trick appeared on the "America's Got Talent Holiday Spectacular," which airs Monday and welcomes back several standouts from previous seasons of the series. Auditions for "America's Got Talent" return to Philadelphia on January 14.